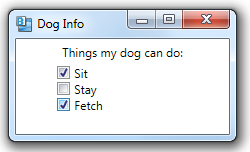 The CheckBox control allows a user to toggle the state of something in an application. The user uses the left mouse button to check/uncheck the control, turning something on or off. You specify a label for each CheckBox using its Content property. The IsChecked property indicates whether a CheckBox is currently checked. It can be read from or written to. You can also use data binding to bind the IsChecked property to a boolean variable. The Checked event fires when a user checks the CheckBox. The Unchecked event fires when a user unchecks the CheckBox. The Click event fires whenever the user checks or unchecks the CheckBox.